Rubbermaid 4095 Equipment Cart Xtra Durable and attractive carts function in front and back of house applications. Rubbermaid 1314 Tilt Truck Utility Duty 800 Litre Rotomoulded Tilt Truck Industrial strength construction transports and One person tips heavy loads with ease. Rubbermaid 2523 Mobile Two-Step Stepstool Heavy-duty step stool glides easily on retractable rubber castors. 208L Food grade Rubbermaid Round BRUTE Containers. Durable, heavy-duty containers for a variety of uses. Large Rubbermaid 4091 Xtra Utility Cart, Large shelves hold various equipment and supplies. easy clean. Easy grip handles . For back or front of house. 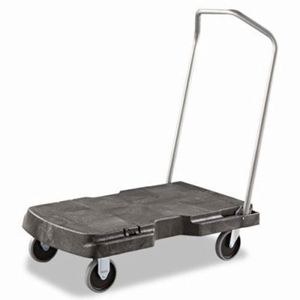 Rubbermaid Heavy Duty Platform Trolleys Ideal for moving large, heavy loads in almost any environment Powder coated steel. Rubbermaid 4500 2 lipped Shelf, structural foam, Utility Cart transport equipment and heavy loads in any environment. Lipped shelf to prevent small objects from getting lost. Sturdy structural foam construction won't rust, dent, chip or peel. Rubbermaid 4608 Cube Truck 340 Litre capacity. One of a full rangeof trucks for waste collection, material transport and laundry handling. Rubbermaid 9T68 Executive Service Cart, The elegant and versatile solution for back and front-of house tasks. Rubbermaid 9T92 Triple Capacity Cleaning Cart High capacity bags provide multi-stream waste sorting for efficient, cost-effective recycling. Rubbermaid 4400 & 4401 Triple Trolley Efficiently transports large bulky loads and then folds flat for easy storage. Straight Handle locks in position for pulling or pushing. Folds flat for use as dolly.